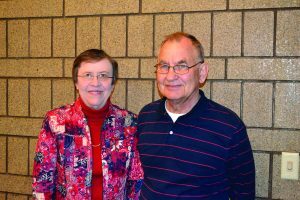 Connie and Dan Turek are volunteers for the Friends. Connie works with the inventory of children’s books, sorting and shelving, while Dan helps list and price books for online book sales. Connie has been “hooked” on volunteering ever since a friend asked her to join the group shortly after her retirement 10 years ago. Dan followed four years later because it’s an activity he can share with his wife. “I had skills to share and I enjoy it,” he said.